Frank Kuhns To obtain a downloadable copy of the worksheet that accompanies this bulletin board, click on the button below. INTERACTIVITY: The first activity will be to find all the prime numbers under 50 by using the process known as the Sieve of Eratosthenes. Students will interact with bulletin board initially by pulling all the flaps down on the blue TV screen (If they are not already down). They will then follow the directions on the worksheet on how to use the sieve. After they do the first item on the worksheet, they then go through all 10 channels, pulling up the flaps and trying to figure out whether the number underneath is a prime or not. DIRECTIONS FOR USE: The Sieve of Eratosthenes is a procedure from ancient times that was used to find relatively small prime numbers. Our bulletin board activity helps replicate this process and we will also try our hand at finding other prime numbers greater than what we will on the bulletin board. We want to know all the prime numbers from 1 to 50. Our TV screen has these numbers behind all the blue flaps. Making sure to grab the flap from the top, we first pull down all the blue flaps to uncover our 50 numbers. To eliminate a number as not being prime we push the flap back up to cover it. We know these as composite numbers. After our procedure is finished all numbers that are composite will be behind flaps and all the primes will have their flaps down. We know the number 1 is not prime. So we can eliminate that right away. The next number is 2 and that is of course prime. We leave the flap down for this number. We then proceed to put the flaps up on all the multiples of 2. After eliminating all those multiples we go back to the beginning and move up to the next number. This next number will be prime. We repeat our procedure as we did with the number 2. The prime flap stays down and the flaps of all the multiples of the prime go up. We continue the process until we cannot leave flaps down or put flaps up. We have discovered all the primes up to the number 50! Listed on the worksheet are the whole numbers 1 through 100. Your next task now is to repeat the procedure (the Sieve of Eratosthenes) on this list. 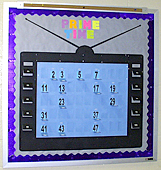 After you have finished finding all the prime numbers up to 100 we will then go back to our TV. Checking all 10 channels (lifting up the black flaps), you must figure out if the number on each channel under the flap) is prime or composite. SPECIAL CONSTRUCTION: A multitude of flaps and Velcro was used to demonstrate the Sieve. CREDIT: This activity is to assigned as extra credit.